File backup is always a key topic to those of us who store important data. Whether it’s photos, documents, programs or videos, no one wants to lose a priceless digital item. To avert this, we buy software that automatically backs up our data onto a local or remote drive that’s easily accessible in the event of a hard drive failure. Windows 8 has a built-in feature called Storage Spaces that allows multiple drives to combine – making a pool that acts as a fail-over in the event of a crash. Follow our guide on how to set this up so you don’t find yourself regretting it in the future. Choose “Create a new pool and storage space” to begin configuring a space. A USB or SATA drive will be the most common additional drive that’s required for use with this feature. It will not work with just one disk drive. Notice the USB drive that’s available above. Choose to select the desired drive and click “Create Pool” at the bottom. A new window will appear describing the name, backup type, and size of the storage space. Choose a name and drive letter to begin. Simple (no resiliency): Requires one drive. Writes one copy of the data and doesn’t protect from drive failures. Two-way mirror: Requires two drives. Writes two copies of the data, helping to protect from a single drive failure. Three-way mirror: Requires five drives. Writes three copies of the data, helping to protect from two simultaneous drive failures. Parity: Requires three drives. Writes data with parity information, helping to protect from a single drive failure. Because our setup has one drive in the system and only an additional USB device attached, we’ll choose a simple resiliency type. Now a size limit for the capacity space needs to be defined. Enter the maximum size the storage space should reach in the “Size” portion of the settings and press “Create storage space” at the bottom. The drive will be formatted properly and setup in a matter of seconds. Now the storage pool is setup and we can view information about it from the main window in the Control Panel. To rename or add additional space to the pool, choose to “Add drives” or “Rename pool” just to the right side. 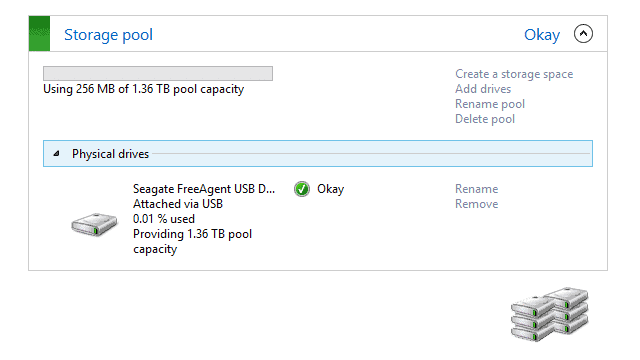 To return to the previous settings, where the drive letter and name were chose, select to “Change” the pool to the right of the created storage space. Maintaining clean backups or choosing the best software can oftentimes be stressful or time-consuming – given that some programs can get quite expensive. Using the built-in feature of Storage Spaces in Windows 8 alleviates these issues rather quickly. With a painless setup and easy-to-understand options, it’s quite a useful data recovery app Microsoft has to offer.